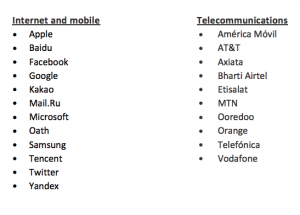 The companies listed above have all been issued the Investor Statement on Corporate Accountability for Digital Rights from the Investor Alliance for Human Rights. This Alliance wants Google, Facebook, and other tech companies to know that they will withdraw their investments if these companies do not take action to address human and digital rights abuses. A powerful coalition of investors is taking action to steer the tech industry toward better practices that protect human rights in the digital age. This coalition contains some familiar names in the socially responsible investing field such as Pax World Funds and Cornerstone Capital Group, but the largest number of signatories are Sisters of various religious orders: Sisters of Saint Joseph of Chestnut Hill, Sisters of St. Francis of Philadelphia, Sisters of the Holy Names of Jesus and Mary, and this is only a few of the religious funds signing on to this statement. Women Moving Millions is having its annual summit and member day on September 13 at the Bill and Melinda Gates Foundation. At the same time in Seattle, Women’s Funding Network is convening its membership at The Collective in Seattle. Both groups will come together in the evening at the Gates Foundation. Both the Women’s Funding Network and Women Moving Millions are in Seattle today, meeting with their members. 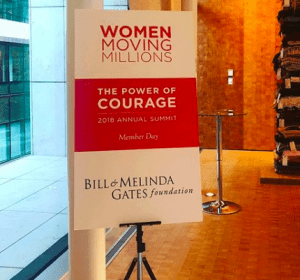 The Women Moving Millions event is co-hosted by the Gates Foundation, and both groups will be meeting up to discuss their work in the evening at the Gates Foundation. One might wonder if this is an indicator of the increasing involvement of the Gates Foundation in gender equality philanthropy. And, in fact, the evening will close with a cocktail hour for the Women’s Funding Network hosted by Women Moving Millions at the Gates Foundation, so there will be some time for the three networks to compare notes. 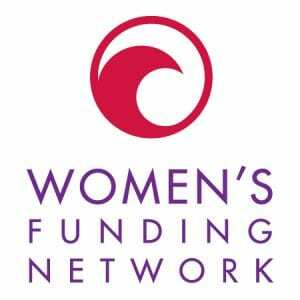 The focus of the Women’s Funding Network meeting is Women+Power. 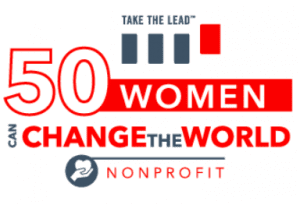 The program includes an overview of the day from Tuti Scott, Founder and President of Imagine Philanthropy, and includes panels on diversity, equality, and inclusion, as well as an evening cocktail reception hosted by Women Moving Millions at The Atrium, at the Gates Foundation. Teresa Younger, CEO of the Ms. Foundation for Women, will also be presenting on a panel with Melanie Brown, Senior Program Officer for U.S. Policy and Advocacy, Bill and Melinda Gates Foundation, and Cat Martin, Vice President of Global Philanthropy for JPMorgan Chase. The full program is here. At the same time that all this was going on, Melinda Gates’ investment and incubation company, Pivotal Ventures, announced the formation of the Reboot Representation Tech Coalition, which will aim to increase gender diversity in STEM occupations. In response to a survey produced by Pivotal Ventures, showing the poor representation of women, particularly women of color in STEM, a coalition of companies will now devote $12 million in funding to address the problem. More on that here. 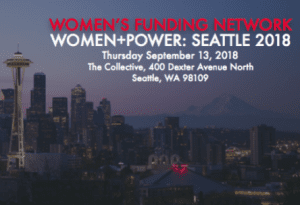 We at Philanthropy Women look forward to learning what these two powerful women’s funding networks come away with from these Seattle meetings. We’re hopeful that more of the Gates Foundation’s resources can be redirected to gender equality causes, since there is a strong need for this kind of movement-building. If a more substantial amount of philanthropy focused on feminist strategies, movements for justice, inclusion, and systems change would have more fuel than ever, and we might start to see how women’s leadership can guide us toward a more sustainable planet. While there has been a recent rise in the number of women running for offices across the United States, the journey towards gender equality in politics is not moving fast enough. Statistics shown in a recent paper written by Saskia Brechenmacher, an associate fellow in Carnegie’s Democracy and Rule of Law Program, prove that gender equality in politics is still far from reach, yet many European countries have come significantly closer to this goal. 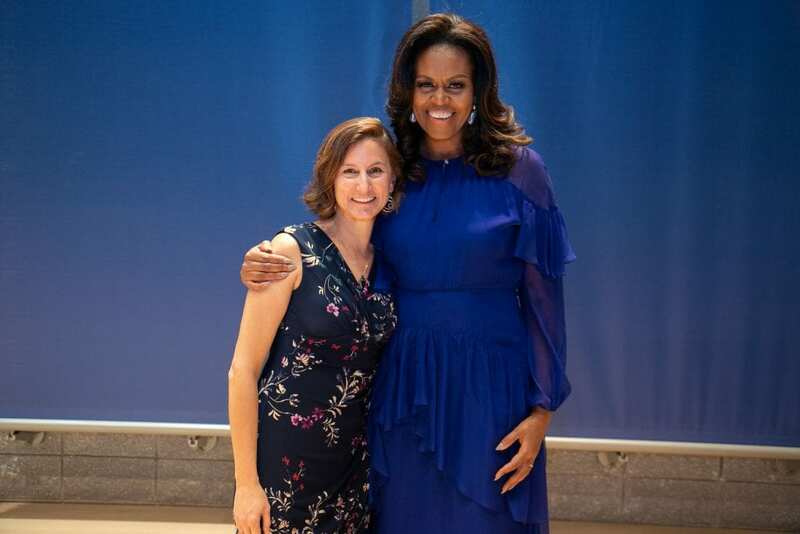 Brechenmacher’s paper provides research about the efforts of such countries and identified moves the United States can make to reach gender equality sooner. As of right now, women make up 19.3% of the House of Representatives and 21% of the Senate. In several Western European countries, women make up over 30% of their respective parliaments. Lack of equality in any government system leads to a structure that does not reflect its population’s makeup, diminishes the voices of women, and weakens the quality of democracy. In the article, Brechenmacher clarifies that this imbalance is less affected by voter bias and more affected by the small number of female candidates. Female candidates tend to be voted into offices just as often as men, yet they are less likely to run because of four major issues. Issue #1: Change America’s single-member voting system. This limits the number of candidates a party can support and shrinks the window for women to enter the political playing field. European countries have adapted systems which allow parties to nominate several candidates, bring a much wider range of people to the ballot. While it is not likely the United States would adopt this same system, 11 U.S. cities use a Ranked Choice Voting (RCV) system instead. This structure allows voters to select several nominees and rank their choices. For candidates, this system encourages a civil approach to campaigning over huge spending. Because of this, it makes it easier for women and minorities to get their name on the ballot, likely not having the same access to funding and connections as men. Issue #2: Establish gender quotas like European countries have done. These can either be mandatory by law or established within political parties, the latter being more common in Europe. With gender quotas, European parties have established percentages of their nominees and recruits to be female, thus integrating women from the lowest levels. In the United States and Europe, proposed gender quotas have received huge pushback, but unlike the U.S., Europeans have successfully implemented several at the local and government levels. This has been accomplished by female-led campaigns, the contagion effect, self-image of parties and party elites, publicizing research promoting such quotas, and making allies. In the United States, recruitment and training of female candidates have taken the place of quotas as an effort to combat this issue. The Republican party has established Right Women, Right Now to recruit and train women for state offices and the Republican Congressional Committee launched a short-lived program GROW to shine a light on women running for house seats. The Democratic party has seen significantly more success with this, however, through EMILY’s List, Women Lead, and the Women’s Senate Network. However, the numbers do not compare to those of European parties. Other options suggested by the Carnegie report are to set numerical targets for parties to recruit women, systematically recruit and support female candidates, address misconceptions about biases held against women running for office, and prioritize internal equality within parties. Issue #3: Deal with the problems of publicly funded elections in the United States. Often, U.S. elections require huge sums of money to get noticed, giving the advantage to wealthy candidates with a recognizable name and connections. Because women have been left out of the world of politics, they immediately face a disadvantage when fundraising and advertising. European countries have taken this into account, making reductions on campaign spending. Some countries have made percentages of government funding to parties based on the parties support for and recruitment of female candidates. EMILY’s List and the Women’s Campaign Fund have made it easier for women to receive funding, but more steps could be taken. Financial incentives for support of female candidates, specific funding for open-seat races, and overall shifts in public financing could further level the playing field for women running for office. 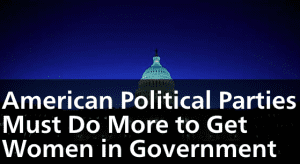 Issue #4: Address the Gender Issues in U.S. political institutions. European countries suffer from these internal barriers as well, but activists have continued to make moves toward equality. Internal gender equality plans, placement of women in leadership positions, improvements on childcare and parental leave rules, family-friendly working hours, and internal support structures have vastly improved the experience of women in office in Europe. In the United States, the Carnegie report by Breckenmacher suggests we should work toward improving data collection, setting internal gender benchmarks, improving childcare and parental leave rules, and combating sexual harassment. With these changes, the everyday experience of female political figures will be vastly improved. Getting these issues addressed will keep the conversation on gender equality going on the local and congressional levels. While European countries have made greater strides than the United States, their movement toward gender equality has plateaued as well. Internal barriers and biases are still huge issues that are the most difficult to uproot. Keeping the conversation alive is the most important aspect of our battle. It will allow for incremental change to continue and will break down stigmas and misconceptions about the power of women today. Read the full paper by Saskia Brechenmacher here. While the Affordable Health Care Act helped to reduce health disparities, there are still significant gaps in funding for women of color. The California Wellness Foundation is finding ways to address these gaps. Research has now identified a significant health care gender gap, showing how much less we know about the health of women compared to men. 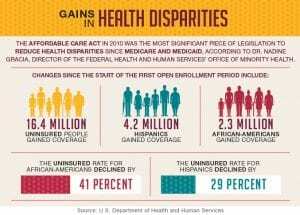 Even more underfunded than women, however, are the specific health concerns of women of color. While Black and Latina women together represent less than a quarter of all U.S. women, they make up the large majority of those currently living with HIV. To fight this disparity, the California Wellness Foundation (Cal Wellness) recently announced $13 million in new grantmaking specifically aimed at helping address the disproportionate impact of HIV/AIDS on women of color, as well as the health needs of recently incarcerated women reentering society. Cal Wellness is a Los Angeles-based private, independent foundation dedicated to protecting and improving Californians’ health and wellness by increasing access to health care, quality education, good jobs, healthy environments and safe neighborhoods. Since its founding in 1992, it has awarded over 9,000 grants totaling more than one billion dollars. According to the National Institutes of Health’s report, Women of Color Health Information Collection: HIV Infection and AIDS, “Compared with females of other races/ethnicities, African Americans and Latinas are disproportionately affected at all stages of infection with HIV and by all reported measures: new cases of HIV infection, annual diagnoses of HIV infection, annual diagnoses of AIDS, and prevalence of HIV infection and AIDS.” In addition, women of color have high rates of sexually transmitted infections (STIs), and are at high risk of acquiring HIV and STIs due to social and economic conditions such as high rates of poverty, ongoing trauma, income inequality and unemployment that make it difficult for them to protect their sexual health. A key part of the HIV/AIDS/STIs initiative is “Upspoken,” a public awareness campaign, coordinated by the issue-driven communications firm RALLY. “Upspoken,” will engage multi-generational Black women and contribute to new ways of thinking about HIV, AIDS and STIs among direct service providers, advocacy organizations, individual and institutional funders, and policymakers. The campaign also seeks to increase understanding and raise awareness about the disproportionate impact of HIV, AIDS and STIs on women of color, and encourage increased funding and improved public policies in this area. 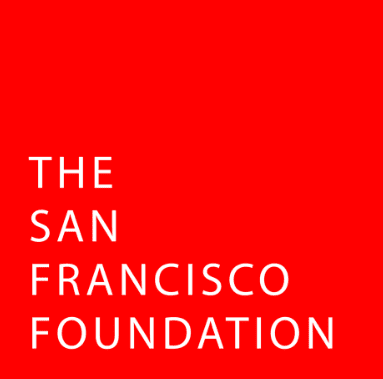 The initiative is funding two demonstration projects—one in Los Angeles County and one in Alameda County (whose county seat is Oakland) to document and disseminate best practices in prevention and early intervention for women of color at risk for HIV, AIDS and STIs, and to develop innovations in this area. 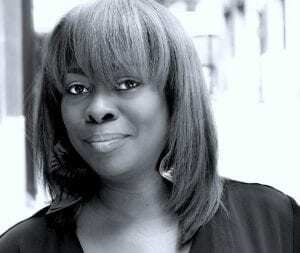 The L.A. County project is being led by Gail Wyatt, Ph.D., Director of the Center for Culture, Trauma and Mental Health Disparities at UCLA’s Semel Institute for Neuroscience and Human Behavior. In Alameda County, Women Organized to Respond to Life-Threatening Diseases (WORLD) is partnering with the East Bay Community Foundation on the project. Cal Wellness is not the only organization supporting the health of women of color. The Oakland, California-based Catalyst Fund/Groundswell Fund is a major funder of initiatives and research surrounding reproductive justice and health, including birth justice with an emphasis on women of color. Catalyst Fund/Groundswell Fund has supported projects in 39 states, the District of Columbia and Puerto Rico, including initiatives of Black Women for Wellness (Los Angeles), and COLOR, a Denver-based Latina-led and Latina-serving grassroots nonprofit, among many. Catalyst/Groundswell also partners with other foundations including the Ms. Foundation for Women, the Chicago Foundation for Women, the New York Women’s Foundation, and Third Wave Fund that provide grants to organizations addressing the health needs of women of color. The health of former prisoners, particularly women of color, is precarious. As is the case with men, women of color are overrepresented among the incarcerated. 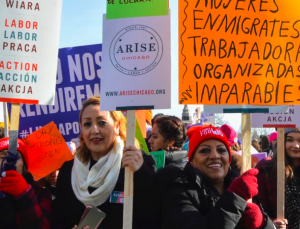 When they return to their communities, formerly incarcerated women face significant barriers to building stable and healthy lives including unemployment and lack of access to education, permanent housing, health care and support in being reunited with their families. For women of color, these barriers are exacerbated by racial discrimination. Cal Wellness’ Re-entry and Employment Initiative will enable formerly incarcerated women of color, especially African American and Latina women, to improve their health through financial well-being by increasing their participation in the workforce and building financial assets. The Foundation awarded grants to four organizations (A New Way of Life, Justice Now, Time for Change Foundation and The Praxis Project) to promote local and statewide policies with a gender lens that impact the specific challenges facing re-entry women. One such policy is effective implementation of Proposition 47, which was passed by California voters in 2014 and reclassified sentences for a number of drug and property crimes from felonies to misdemeanors. The four grantees have established the Women Organizing Re-entry Communities of Color for Prop 47 (WORCC) Collaborative to target Prop 47 resources to benefit women of color as they seek employment and financial well-being upon re-entry. As part of the initiative, Cal Wellness also approved grants to support three demonstration projects (Root & Rebound in Fresno County, A New Way of Life in Los Angeles County and Time for Change Foundation in San Bernardino County). The grantees will engage formerly incarcerated women of color, especially Black and Latina women, in comprehensive workforce development services including job training, career advancement and asset-building. The Center for Employment Opportunities (CEO), which has offices in six states and focuses exclusively on employment for those with criminal records, also received funding and will provide technical assistance.